Hardly anybody knows where Black Friday got its name (stories of businesses finally turning a profit for the year and such abound) but the reality is that with American Thanksgiving finished, the day afterward is the traditional start to holiday shopping. Now, with special thanks to the Internet, you don’t have to be living in the United States to take advantage of the tremendous savings offered by most of the major (and minor) retailers. 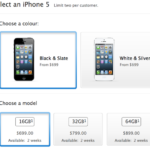 While Apple is not generally known for having much in the way of bargain pricing the rest of the year, a teaser seen on the Australian Apple website gives us a hint of what savings are to come! Details are not yet known, but the tease suggests there may be iPad deals on the horizon. Much like last year, there are several new MacBook Pro models on the shelves which may be good marks for a discount (last year saw up to $101 off your purchase). For those of you looking for stocking stuffers, we may be lucky and see another deal on iTunes gift cards –last year saw a $5 bill off a $50 card. Have you started your holiday shopping yet? Do you plan to take advantage of Black Friday sales? What sites are you readying to visit that day?